Are you a fan of strawberries? If you are, then good for you! Since strawberries are low-calorie food, you do not have to worry about putting on too much weight when drinking a strawberry smoothie. The fact that they are already sweet means that you do not have put tons of sugar in your drink. Many people can never guess that a strawberry smoothie packs a lot of health benefits in each tasty sip. It contains vitamins, fiber, and high levels of antioxidants that are healthy for the body. The vitamins found in strawberries are to thank because they aid in the production of collagen in your body that contributes to your skin’s elasticity. Isn’t it refreshing to know that a strawberry smoothie can help improve your skin when you grab one from our coffee bar in Texas? If you are prone to arthritis, you can benefit from drinking a strawberry smoothie from our dessert bar in Sugar Land, Texas. Since it contains antioxidants and phytochemicals, it helps in the reduction of inflammation of your joints. Yes, a strawberry smoothie has anti-inflammatory benefits! Since a strawberry smoothie contains a well-balanced percentage of fiber, it does not only regulate digestion but also helps in controlling type 2 Diabetes as fiber stimulates the blood to absorb sugar. Since a strawberry smoothie contains potassium, it helps reduce high blood pressure because it balances the effects of sodium in your system. Therefore, it keeps your blood pressure in check. 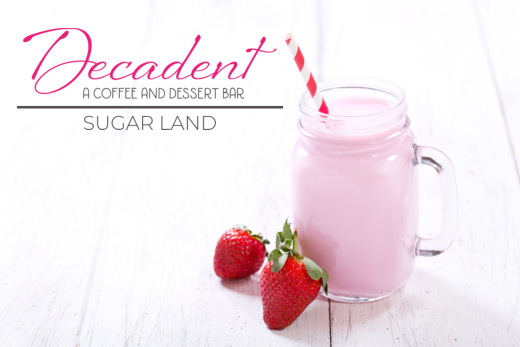 Our coffee and dessert bar in Texas offers strawberry smoothies for everyone to indulge. We also offer other decadent smoothies that are healthy and delicious! This entry was posted in Desserts and tagged health benefits, strawberries, Strawberry Smoothies. Bookmark the permalink.